Have more questions such as do you pay for transaction fees? Read about questions we often get and the answers from our frequently asked questions. We want you to know exactly when you’ll be billed so you can plan ahead your payment. In order for FFQO to process your local and international courier services, we will require upfront payment. Payment for air or sea consignment for exporting is required once the “Bill of Lading” has been issued. Payment for air or sea shipment for importing is required prior to delivery. We have made payment for your freight quick and easy. We accept these different kinds of payment method for your convenience. We give you the option to process your payment via direct bank deposit. Simply provide your bank account details in the invoice and we will take it from there. Worried about fees? Hush! hush! No transaction fees are applied when paying via direct bank deposit. However, note that we do banking transactions via CitiBank. You can call toll free on 1-877-901-2004 to to tell us your credit card details and we will process it for you. Otherwise, we can email you a “Request for payment” link from PayPal where you can securely submit your credit card. Read our FAQ at the bottom of this page for transactions costs when paying using credit cards for payments. You can securely pay online via our PayPal account. See our PayPal account posted in your invoice. Otherwise go to the top of the page and pay now button via Pay Pal. 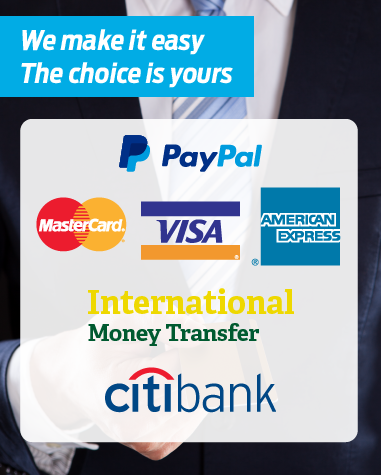 If you must, you can pay via International money transfers. Please contact us for additional details. Read our FAQ at bottom of page for transactions costs when paying using International money transfers for payments. No. Actually, this is our preferred method of payment because it does not charge any fees. Are you inside the USA? If you’re within the USA, click here to read PayPal’s “Transaction Fees for Domestic Payments.” To allow for us to deliver our competitive prices, we need to add these costs to your invoice payment. If you are outside the USA, click here to read the PayPal’s “Transaction fees for Cross Border Payments.” For us to deliver our competitive prices, we need to add these costs to your invoice payment. Do you charge fees for using International money transfers? Yes we do, but they are on a case-to-case basis, depending on which bank and country. Contact us and we’ll be happy to work out the details with you.